Curiously, placental mammals never entered Australia until relatively recent times, which is why we have so many marsupials Of placental mammals this region has many species of bats, both megabats (suborder Megachiroptera) and microbats (suborder Microchiroptera). The megabats include spectacled flying foxes (Pteropus conspicillatus) our commonest flying fox, black flying foxes (Pteropus alecto), little red flying foxes (Pteropus scapulatus), (both of which are rare “vagrants” from nearby areas). We have tube-nosed bats (Nyctimene robinsoni) and two kinds of blossom bats, the common blossom bat (Syconycteris australis) and the Northern blossom bat ( Macroglossus lagochilus). 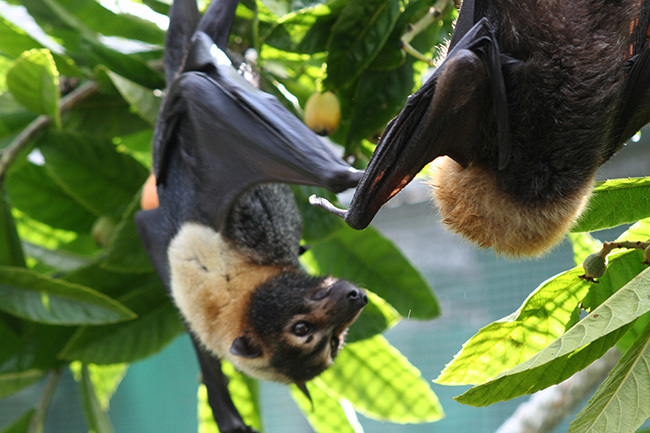 All of the megabats are non-echolocating fruit - and nectar-eating bats with large eyes and ears, long, doglike or lemuroid faces, and generally, no tails. The spectacled flying fox has blackish-brown fur on most of its body, with a lighter "ruff" around the neck which can range in colour from a light cream to a deeper, reddish brown, slightly lighter, grizzled patches on their stomachs, and light-coloured rings around their eyes which somewhat suggest eyeglasses, hence the name “spectacled”. The two blossom bats are very small - similar in size to many microbats (15 g), but look like flying foxes in miniature. The tube-nosed bats are the most unusual of the megabats. With their protruding, tubelike nostrils, fairly short, broad faces with huge, orange-coloured eyes, and light brown fur with a pattern of greenish-yellow spots, they look like little goblins -. They can also be recognised by their characteristic high-pitched tweeting flight call. The Daintree rainforest is also home to a number of insectivorous, echolocating microbats, which are conspicuously different to the megabats in appearance, physiology, and behaviour. They tend to be much smaller than the megabats (although there is some overlap with the blossom bats), they have conspicuously bigger ears and smaller, more widely-spaced, sideways-facing eyes than megabats. These visual and auditory differences reflect their use of echolocation to find prey and avoid obstacles, and many species have elaborate facial folds and protrusions, probably also related to echolocation. They are more strictly nocturnal than the megabats, and although they roost together in great numbers during the day, by night they are solitary hunters who interact very little with other bats. Many species enter periods of prolonged torpor (a mild form of hibernation characterised by lowered body temperature), typically in winter. They have a much shorter gestation period than megabats (typically twelve weeks as opposed to six months) and the young are born nearly hairless with eyes closed. It has been hypothesised these profound differences between microbats and megabats indicate that the two traditional suborders, Megachroptera (megabats) and Microchiroptera (microbats) actually have entirely different evolutionary histories, the megabats having evolved from a primate-like ancestor similar to a colugo or lemur. 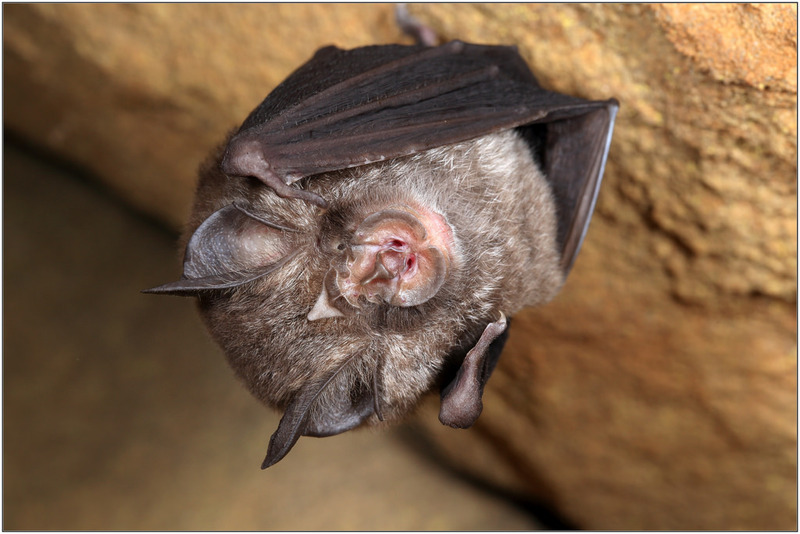 Species in the Daintree area include three species of the horseshoe bats, genera Hipposideros and Rhinolophus, and the vespertilionid bats of genera Myotis, Nyctophilus and Murina. The bentwinged bat ( genus Miniopterus) is also common. Although the small, furry animals Australia is best-known for are its marsupials, the Daintree area is also home to about 6 species of native rodents, which are placental mammals too. These species include both rats and mice. 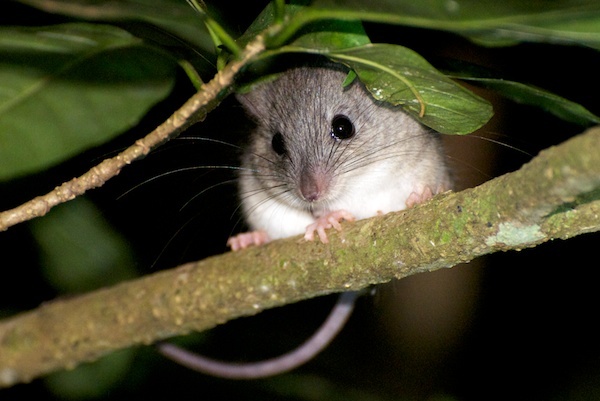 In the Daintree area, the most common of these are the white-tailed rat (Uromys caudimaculatus) and native mice, mostly the fawn-footed Melomys, (Melomys cervinipes and Burton's Melomys, Melomys burtoni. We have several species of rat (Rattus) – R leucopus, R sordidus and perhaps several others. The water rat, Hydromys, once common, is now rare, thanks to cats. The Daintree area has relatively few marsupial species compared to other parts of Australia. In the Cape Tribulation area, the two commonest marsupials are the striped possum (Dactylopsila trivirgata). Occasionally we encounter ‘vagrant’ possums from higher altitudes. Also the northern brown bandicoot (Isoodon ) and the long-nosed bandicoot (Perameles nasuta ) The bandicoots are about rabbit-sized with coarse fur. The striped possum has black and white stripes running longitudinally along the body and tail, giving it a somewhat skunk-like appearance. Bennett's tree kangaroo (Dendrolagus bennettianus) are occasionally seen in the area, but they are extremely uncommon (vagrants). Unlike typical kangaroos, these are nocturnal and arboreal, making them less likely to be seen in their natural environment.